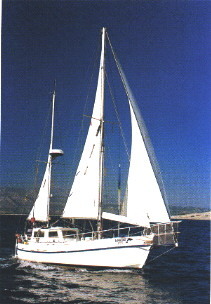 This yacht was our home for many years and has braved over 40.000 nautical miles. Now that we are back from our big trip you can sail with us in one of the nicest sailing areas. The Croatian islands are an ideal place to spend a holiday aboard among the multitude of islands, anchorages and little historic towns. Thanks to all who sailed with us in previous years for the enjoyable time we spent together. We hope to see some of you back again this year. Newcomers to life afloat and to sailing will soon appreciate the fun on board and look forward to the moment each day when the wind fills the sails. Some days we'll beat up to windward and others we'll glide in a light breeze with the cruising chute. And those who want to feel the pull of the wind can rig the windsurfer at the anchorage. Everyone enjoys the quiet anchorages, the quaint fishing villages, the colourful markets and the brilliant sunsets. Time to lay back and relax!